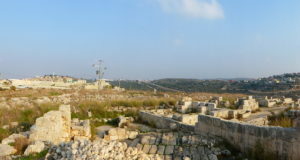 On the night between July 9th and 10th, Nablus was again was invaded by the Israeli army. This time health clinics, two women’s centers, the local TV-station Afaq, the shopping mall for the second time and a mosque was attacked and school buses were stolen. In all locations computers, files and other important equipment was confiscated. 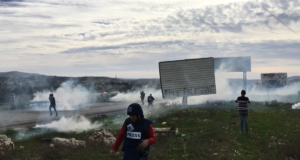 Afaq, a local TV-station of social issues, financed by commercials, has been invaded by the Israeli army two times before, but last night was arguably the worst. Between 12.30am and 5am in the morning of July 10, 2008 the army broke in to their workplace in central Nablus.When Aisa Abu Elizz and his colleges arrived in the morning they found their door welded. All electronic equipment and furniture was taken or immediately destroyed by the military. The military also left a paper which stated the order to close the TV-station for one year. The order claimed the importance of defeating terrorism and that Afaq were supporting terrorism. The plan of Afaq is now to try to make a complaint to court. The Women’s Centre of Nablus is a social centre for women and children. The center support women economically and socially by organizing summer clubs for children, a bakery to support children with food and much more. At 12 o’clock at night to the the army entered the Women’s centre. They took five computers as well as files and books with addresses for the organizations work.No reason was given to why the centre was raided by the army. Immediately the same day after the invasion the women centre organized a protest against the invasions with a message to the Palestinian Authorities to support them against the Israeli army’s violations. A women’s centre in al-Farah camp was raided the same night. Patient-Friend society is a polyclinic in the centre of Nablus. At 12 o clock at night the clinic was raided by the Israeli army. The army stole six computers and as many documents they could find by breaking in to cupboards. A lot of information about patients was lost during the night’s incursion. The clinic was raided before some years. Now, as then, they will try to complain to court in an attempt to get their materials back. Previous times they did not succeed in this. 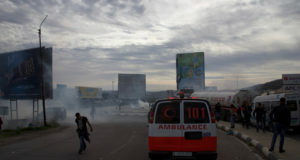 In total during the night health clinics were raided, along with the TV-station, a shopping mall, a mosque and women’s committees. Also school buses were confiscated. All in all, added up with previous nights incursions the army’s violations make a hard blow against the social and economical life of Nablus.